She was the youngest of 12 kids, and when she became of age, was responsible for all of the family cooking. To this day, all of Pupatella’s cheeses and meats are flown in from Italy, and toppings, sauce, and dough are prepared fresh daily. Pupatella – “little doll” in Italian, a tribute to Alagarme’s nonna – was named the best pizza in Virginia, Maryland, and Washington, D.C. by the Washington Post, and USA Today named it the best ‘za in Virginia. The first Pupatella opened in Arlington, Va. in 2008, and showing aggressive growth, in 2016 the company filed the necessary documents to begin expanding through franchises around the mid-Atlantic and beyond. In 2017, Pupatella’s second brick-and-mortar location opened in Richmond at 1 N. Morris St. on the campus of Virginia Commonwealth University. The location had been a difficult one for past restaurants, but Puptatella seems to have broken the mold – it has served more than 40,000 pizzas since its launch and shows no signs of slowing. Pupatella RVA franchisees Nasim Kaba, Omar Javery, and Aneeta Javery have signed on to open three additional Pupatella restaurants in the greater Richmond area. The second location will open in Richmond’s West End, the third in Midlothian, and the fourth is still being determined. To get there, like any aggressively expanding business, Pupatella RVA needed a little capital. Virginia Community Capital, an approved Small Business Association-guaranteed lender, has provided a loan to Pupatella RVA to help finance tenant improvements, restaurant build-out, and working capital to get the second location – near Innsbrook Corporate Center – up and running. The previous tenant at 10921 W. Broad St. was also a pizza restaurant, so many of the foundational elements of a pizza kitchen are already in place – allowing for a faster buildout than normal. 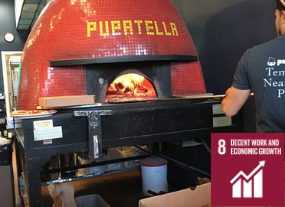 Pupatella RVA management believes their second location will see even greater numbers than its downtown one due to a more easily accessible location in Innsbrook, and expect a strong lunch crowd from nearby office workers along with a strong suburban dinner base. Pupatella is a company centered on family, tradition, and authenticity. VCC wants to ensure that communities continue to keep places with such a spirit alive and growing. Supporting a company that creates fresh, premium-dining options at an affordable cost – not to mention new jobs – is key to a community’s prosperity. VCC is an SBA-Preferred Lending Partner and therefore has the option to use its authority to expedite the approval process for these federally backed loans. Our Loan Officers are trained in SBA eligibility and can save time upfront on structuring the best option for borrowers such as Mountain Top. For these reasons, VCC has become a top SBA lender in Virginia. VCC’s staff also has expertise in USDA and other loan-guarantee programs. In addition to financial backing, our lenders and experts offer free technical advisory services to partners and connect business owners to local networking opportunities to ensure the success of the people, businesses, and communities we support.